Publisher Synopsis: N. K. Jemisin is one of the most powerful and acclaimed authors of our time. In the first collection of her evocative short fiction, which includes never-before-seen stories, Jemisin equally challenges and delights readers with thought-provoking narratives of destruction, rebirth, and redemption. I’m taking a chance here since I’ve not actually read this book. But here’s why I’m taking a chance here: For our VSB/Mahogany Books Book Club, one of the books we read was the Well-Read Black Girl: Finding Our Stories, Discovering Ourselves anthology curated by Glory Edim, founder of Well-Read Black Girl. One of the essays was written by N.K. Jemisin, who I’d heard of only because I’d seen the title of her book, How Long ‘Til Black Future Month?, in book stores, and I LOVE it as a title. When I tell you that her essay in the anthology, “Dreaming Awake,” had me at hello!? Long ago, in the time before now, black people were kings and queens. There is a strange emptiness to a life without myths. I am African American—by which I mean, a descendant of slaves, rather than a descendant of immigrants who came here willingly and with lives more or less intact. My ancestors were the unwilling, unintact ones: children torn from parents, parents torn from elders, people torn from roots, stories torn from language. Past a certain point, my family’s history just...stops. As if there was nothing there. I basically perked up and decided right then and there that this woman was about to be one of my new favorite writers. I devoured her essay, and you should read her whole essay because, well, trust me, I’m a blogger. 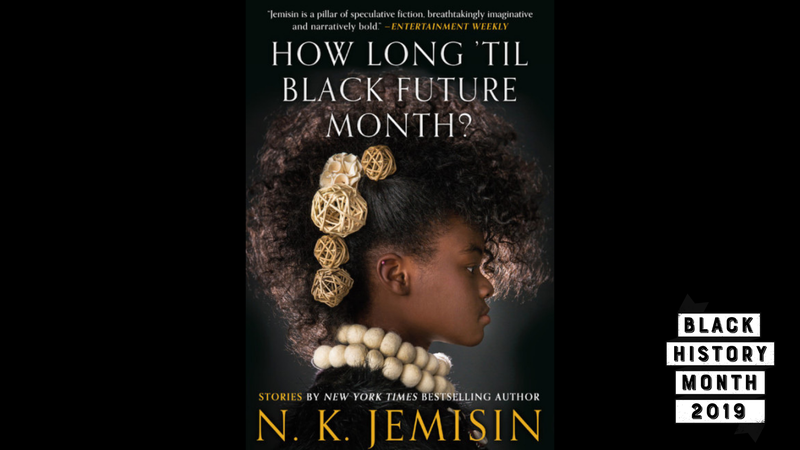 Turns out she’s an award-winning science fiction writer with trilogies and series and all the things that we all should read and How Long ‘Til Black Future Month is a collection of short stories. I’m all in. I’m sold. I will read her science fiction books for which she’s won a specific award for like three years in a row, which I don’t think anybody else has ever done. Point is, it’s funny how one verse can mess up the game, and with one essay, N.K. Jemisin is somebody who I determined I needed on my bookshelf because my book shelf was missing her and this is the book I will enter that journey with. Also, everybody who does read her raves about her writing. I’ll be damned if she ain’t right.